Thanks to technological advancements and innnovations in manufacturing, modern kids have so much more at their disposal than was the case a few years back. Kids battery-powered vehicles are very popular today due to the huge amounts of fun they provide not only to the little ones but also to us parents! They come packed with lots and lots of features that ensure a fun ride and encourage imaginative play. You can find a range of these products on the market today that are both the 6v models and the more powerful 12v models which are great for bigger kids up to 6 years old. The most popular brand is Fisher Price and their range of power wheels toys which have a solid reputation for high quality, durability and imaginative design. Here’s a look at some of the top kids battery-powered vehicles by Fisher Price from the Power Wheels range. This 12V battery powered kid’s ride comes with unique features that can take any kid to a whole new level of inventive play. Recommended for children above 3 years, it’s built to handle different terrain and last long. The Jeep comes with built-in rockin’ radio & microphone with a voice amplifier, which ensures an exciting experience for your young one. Other features include Rear cargo storage area for all your kid’s gear, two speeds forward; 2.5 and 5 mph, and 3 AA batteries (used for pretend radio). This top vehicle is designed for maximum safety . It comes with high speed lockout and power lock brakes that stop it within seconds. Lil’ Kawasaki promises lots of fun and excitement for kids aged one year and above. With unique bright red colors & cool decals, it’s an excellent and thrilling ride-on quad bike. It’s designed with children-friendly features even for the youngest riders (such as built-in footrests and a push-button for easy stop-and-go). This Fisher-Price model drives a safe, but still exciting, 2 mph (max) on hard surfaces as well as grass. 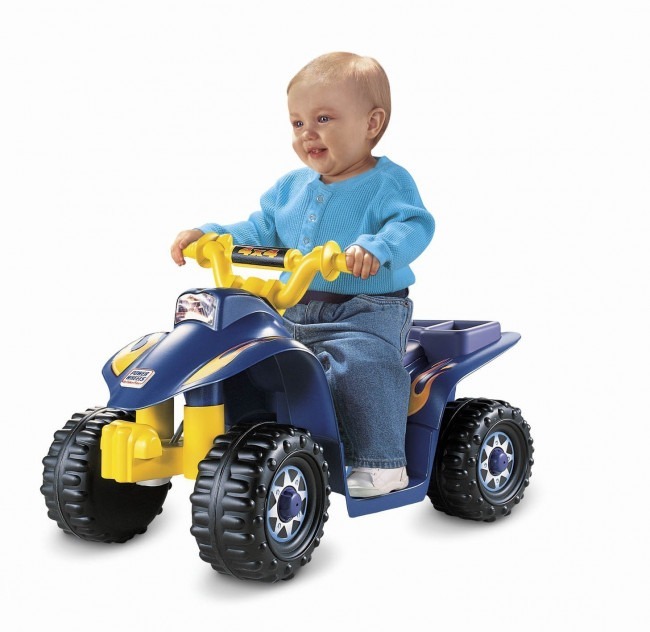 It comes with a 6-volt battery, plus charger, and promises a comfortable ride for your little one. Note that it’s designed exclusively for outdoor use. Furthermore, adult assembly and supervision is required when it’s in use. Easily one of the Best Kids Power Wheels Vehicles on the market, the Lil Quad is designed for kids aged between 1 and 3. The manufacturer seems to have built it with toddlers in mind as there’s a simple push-button operation for stop and go. This model rides low, something that makes it easy for the rider to get on and off all by themselves. It looks quite sturdy and is backed by a 1 year limited bumper-to-bumper warranty. Other features include built-in footrests to ensure maximum safety, beautiful cargo rack and two forward speeds (3.2 km/h max). It can drive without fuss on both hard surfaces and grass, and includes a 6-volt battery plus charger. This power wheels electric vehicle is designed to provide kids with the excitement of ATV riding right in their own backyard. Its one of a kind Monster Traction drive system can power through any kind of terrain including gravel, ruts, wet grass, mud and so much more. It comes with two speeds forward (2.5 with 5 mph, max), as well as reverse. The safety element is not left out with the Kawasaki KFX! There are high-speed lock-out (optional) and Power Lock Brakes. 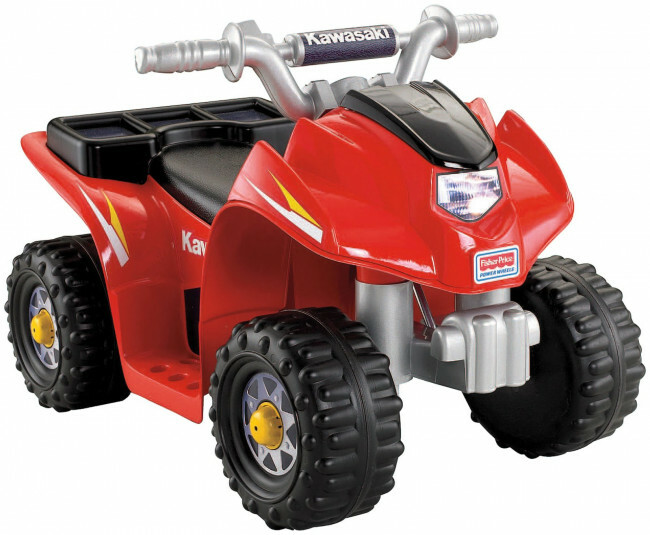 Buy the Fisher Price Power Wheels Hot Wheels Kawasaki KFX Quad Bike discounted on Amazon now! Other features you can look for include stunning "chrome" accents, unique graphics and twist grip throttle. The model is powered by a 12-volt battery and is suitable for children aged 3 years and up. It is higher powered than the other vehicles on this page and for the bigger toddlers. The Ford F150 is the perfect ride for your child as he explores your backyard. It can drive on hard terrain as well as grass, and is designed to withstand rugged use. Suitable for kids aged between 2 and 4, it’s loaded with amazing features such as side-view mirrors, huge tread off-road tires, large storage bed and built-in windshield. 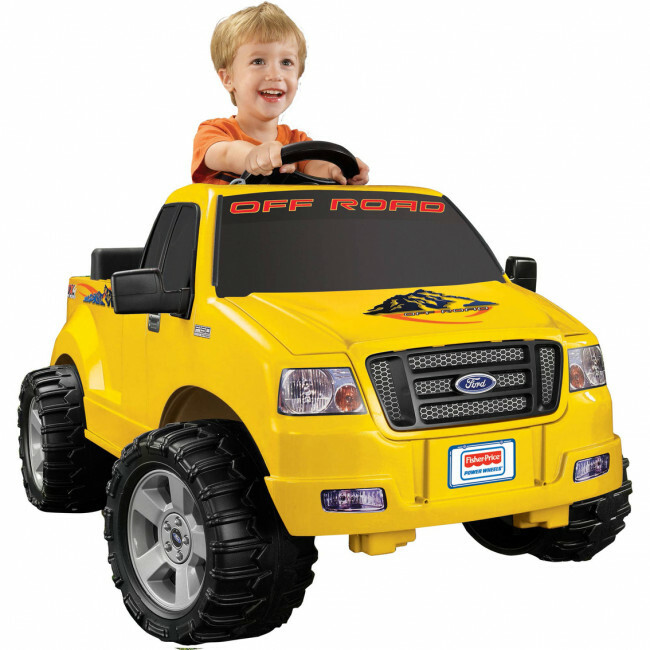 As with other models from Fisher Price, safety has been given consideration with the F150. It has a power-lock brake system that lets your kid stop the vehicle both quickly and easily. Buy the Fisher Price Ford F150 Power Wheels (Yellow or Gray) discounted on Amazon now! With so many kids power wheels vehicles on the market, you would expect that it's a tough job comparing different models to see what is suitable for your young one. But this does not have to be the case. Before you go out shopping, you need to understand what features to look out for. 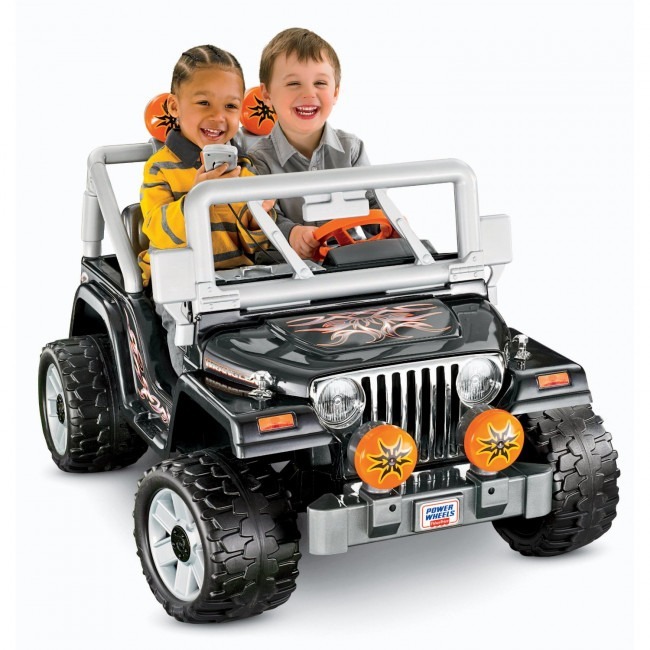 Power wheels vehicles will have different features and gadgets suited to different ages, riding surfaces and needs. But while you are deciding, remember to never compromise on safety. That's why we trust Fisher Price to create the best kids electric cars, trucks and rides. Look for a model that offers a comfortable and safe ride for your little adventurer. 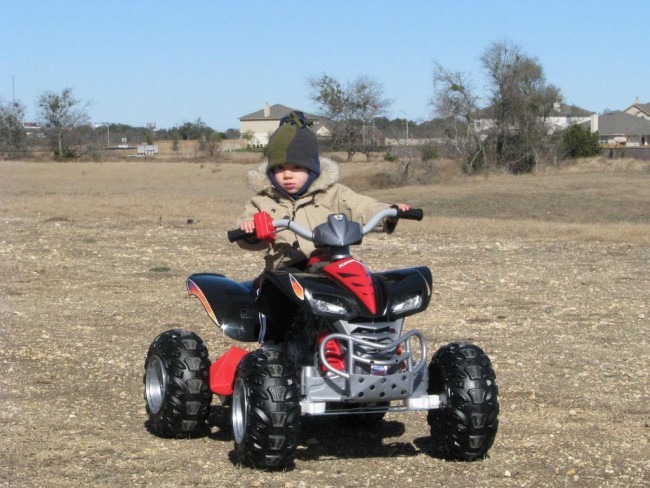 We hope that you enjoyed this article from Toyrider, the best in kids ride-on toys reviews. Please go ahead and leave a comment if you know these vehicles or would like to ask a question! Video of Power Wheels Collection - 21 Cars! Thanks for another great article. We hope you all find this comparison useful!